The AM Marine Trimming team have many years experience in manufacturing the various covers that a narrow boat requires. Whether you need a bow and stern tonneau, cratch cover or a full stern pram hood style hood we can help. Also available are material access point guards for use on cruiser style sterns which have proved to be a useful device for keeping pets on board. 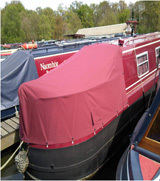 Available in PVC or canvas we can supply and fit the range of covers and attach all the required fittings to your boat.